A 27-year-old suspected kidnapper, Emmanuel Okemayin, has confessed that he formed a kidnapping gang in a bid to raise money to travel abroad and further his education, following the death of his father. 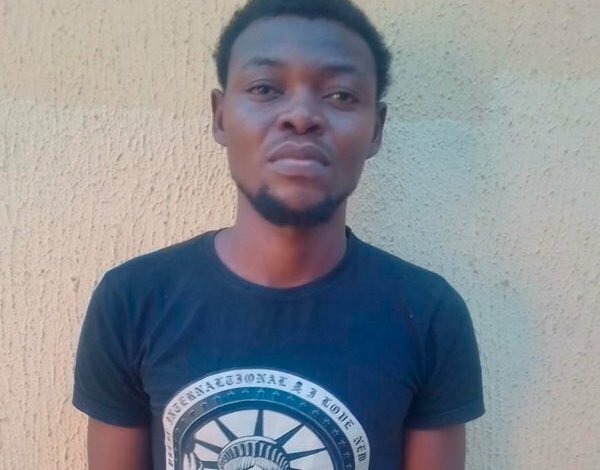 Okemayin was arrested by operatives of the Federal Special Anti-Robbery (SARS), Lagos State Police Command, following a botched kidnap attempt. “I was arrested for planning the kidnap of my boss’ wife which failed. I had good grades in West Africa School Certificate- Government, A1; Economics A1; Biology, A1; Geography, P7; Literature in English, P7 and Chemistry, P7. I can’t remember what I got in English language and Mathematics. I am qualified to go to university," Okemayin said. "My financial problem started when I went to Yaba College of Technology, Lagos, and they told me to pay N120,000 for registration, but I had no kobo on me. ‘’They even told me to pay in bits by paying only a sum of N50,000 in subsequent payment, yet I knew that I still could not afford it. When I calculated the feeding money and other expenses I decided to call it quit. ‘’I started searching for jobs and found one in a hotel, on Iju Road, Agege, Lagos, on a monthly salary of N8,000. I worked there for two years and later travelled to Benin, Edo State, and stayed there for two years. I returned to Lagos in 2014. The suspect said he later saved some money to procure an international passport and spent about N200,000 to get a visa. His problem however started when he could not raise money to take care of his flight ticket. Frustrated, she resigned from the company and got another job a driver through one of his friends, Ejike. ‘’Ejike assisted me to secure a job. I was driving a married woman who has an office in CMS, Lagos, on a monthly salary of N40,000, without no allowance of any kind. "After driving the woman for few weeks, I found out that her character was too bad and the way she addressed people was dehumanising. When I narrated my ordeal to a colleagues of mine called Austin, he advised me to be patient since I have not worked up to a month. ‘’The next day, I took her to a native doctor and she was behaving in a way that made me to see her as a heartless person. When I narrated my experience to Austin he reasoned with me. We planned to arrange somebody to attack us, when madam would be carrying huge sum of money. In his confession, Okemayin’s accomplice, Austin Anyia, 30, who was a driver to the victim’s husband said: “I am from Akokwa in Ideato North Local Government Area of Imo State. When Emma (Okemayin) told me that the woman was rude, I advised him to take it easy but when the woman became rude [to me] I decided to join him in teaching the woman a lesson.